Two words: fresh and ripe. Let me list the number of fruits and veggies that I saw growing locally in the country: bananas, mangoes, cactus fruit, oranges, lemons, limes, cucumber, tomatoes, olives, figs, pomegranates, cherries, apricots (mish mish in Arabic haha), peaches, nectarines, grapes galore, dates (that come from date palm trees!! 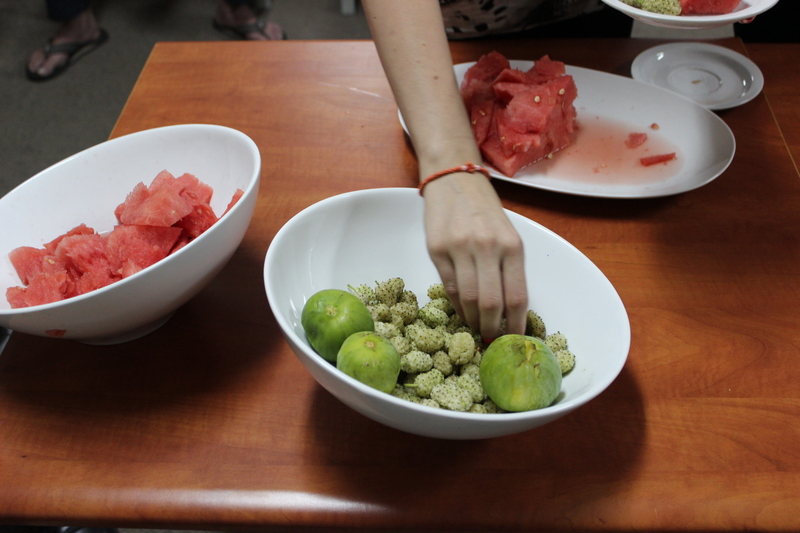 ), watermelon, canteloupe (that is oval shaped), avocado (that is bigger than your fist), almonds, and a whole lot more! Every single thing tasted so much sweeter and juicier. No transport trucks or airplane deliveries, or however Safeway gets their fruit..
My top three favourite produce was 1) bananas – so sweet and small 2) watermelon – especially in Palestine, so damn good 3) tomatoes – so red and delicious. I might start drooling..
You must understand that I mostly hung out with Israeli Palestinians or Palestinians who eat Arabic food. Every. Single. Day. We had pita and hummus. You know how in Canada we have a giant aisle for our yoghurt? Well they have a giant aisle for different hummus brands. Craziness! Pita bread was the blank canvas that could have been decorated with a spice called za’atar. It contains hyssop (so Biblical! ), coriander and sesame seeds. (Find a photo instagrammed on the right side column). Pita may have also been used with a milk based spread called lebaneh. It’s like a salty cream cheese that is usually paired simply with olive oil. We had the most amazing salads, because the veggies were so good. 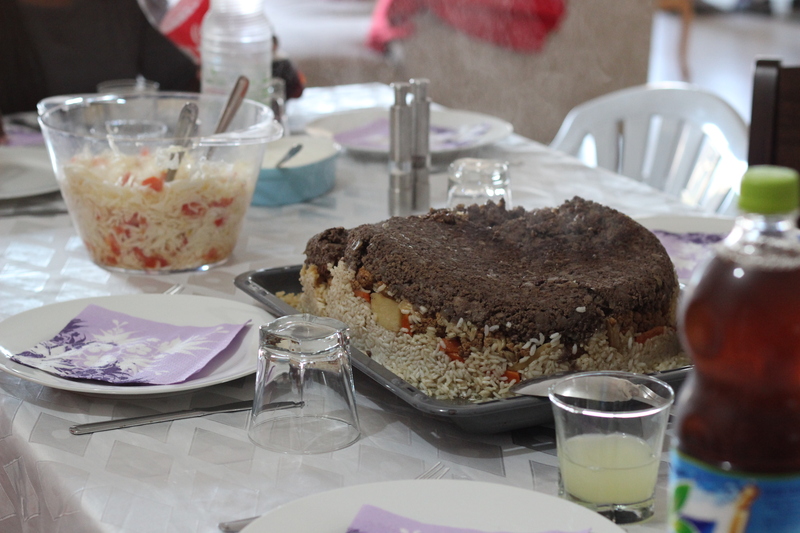 Other amazing dishes that I can remember are tabbouleh, hashweh and makloubeh (It means upside down in Arabic – there’s a photo above) I’ll attempt to make all of them some time in the near future. An amazing breakfast dish we had was Shakshouka. You fry onions, add tomatoes and tomato sauce/paste, and fry eggs in it all. It’s super delicious. It’s like dinner for breakfast. I really appreciated that olives were commonly served at most meals, and that olive oil was used in or on everything. They also used cabbage in all salads. Lettuce wasn’t as common as cabbage. 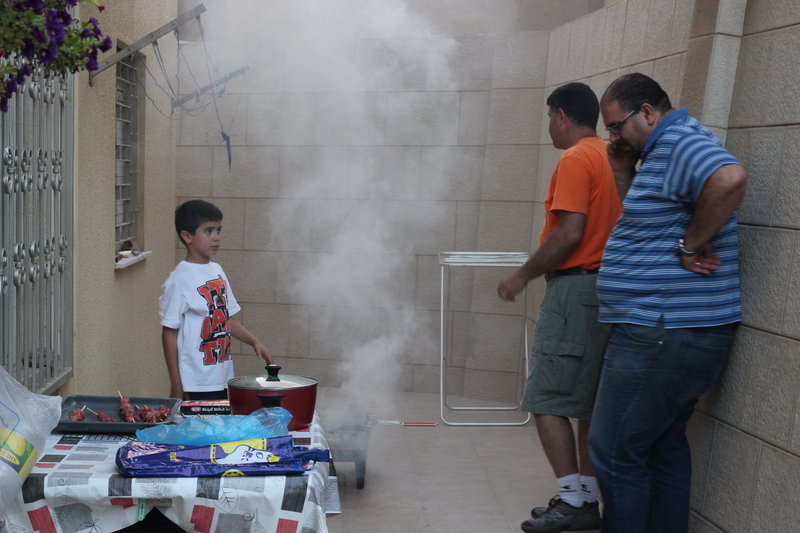 Arabs, in my opinion, make the best barbeque I’ve ever had! They grill using coal, instead of gas, so sometimes the whole house fills entirely with smoke. I enjoyed the most tender chicken, beef, pork and kebab. 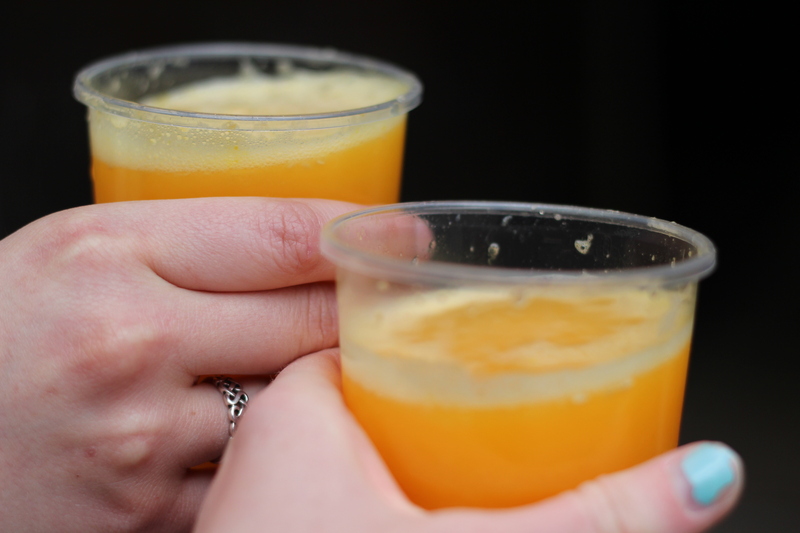 A cool drink we enjoyed a lot was freshly pressed orange juice sold on the street for 15 shekels, and lemonade with mint. Mint was widely used in most dishes, which I thought was super cool. Falafel! Oh my goodness I enjoyed the most amazing and freshest falafel I’ve ever had. Same goes for Shawarma. I’m adding a picture I took of my fav falafel place that we found in Nazareth. Lastly, the desserts were incredible. We had baklava and kanafe, which are super complicated looking pastries. Kanafe is stuffed with white cheese, glazed in sugar and coated with pistachios on top. So different but so good! It’s the orange and green looking stuff in the photo. You have to know about the coffee. They don’t make coffee like us. In fact, most countries really don’t understand why we make such watery coffee. We survived on instant coffee served at every accomodation we stayed in. There’s also Arabic coffee (also called Turkish coffee). It is the most interesting and delicious blend of spices. They use cardamon to make it and it is grounded very finely. It’s like a chai tea coffee. It’s very strong so it is drunk out of small espresso cups. An amazing snack we had was called Bomba (I don’t even know how it’s spelled since the bag was always in Hebrew or Arabic). It’s the king of all junk food. It is like peanut butter Cheetos, minus the cheese flavour. You could also find it filled with chocolate!! Sababa and zack kteer (زاك كتير) for suuuuresies. If you’re lucky enough to hang out with me at a feasting time, I brought home za’atar, Arabic coffee and Bomba!